Apples, cotoneaster, pyracanthas, crataegus and sorbus. 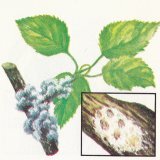 Woody swellings and tufts of white wool on trunks and branches. Where possible, brush a spray-strength solution of malathion or BHC on to affected areas when wool first appears or to apply one of these as a spray. Systemic insecticide such as dimethoate or formothion may also be used. Plants affected: Greenhouse and house plants, especially cacti, other succulents and climbers. Symptoms: Colonies of mealy bugs covered with mealy or waxy wool usually concentrated around buds and leaf axils. Treatment: Spray thoroughly with systemic insecticides such as dimethoate or formothion or with non-systemic insecticides such as malathion or nicotine. Plants affected: Cherries, plums, gages, damsons and ornamental prunus species. 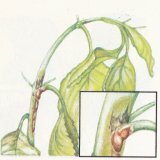 Symptoms: Elongated, flattened, canker-bearing exudations of gum on shoots that are dying back; leaves yellow and wither prematurely. 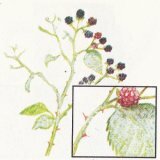 Treatment: Cut out infected branches and paint all wounds with a wound-sealing compound. Spray the foliage in mid-October with Bordeaux mixture. Prune during the summer only. 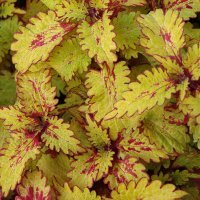 Plants affected: Euonymus michaelmas daises, roses, gooseberries, apples and many other types. Symptoms: White, powdery coating on shots. 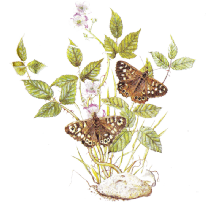 Treatment: Cutout severely affected shoots on trees and shrubs in the autumn. Spray regularly with benomyl,dinocap or thiophanate-methyl. Lime sulphur can be used on some types of apples and copper and sulphur sprays can be used on herbaceous plants and shrubs in hedges. In the greenhouse, fumigate with dinocap smokes.